Alcatel Pascal 2063 series pumps have a pumping speed of 42 CFM (60 m3/h) and are used in the most demanding applications in industry, analytics and research & development. Applications such as optical coatings, vacuum drying, space simulation, and RGA are some common uses. 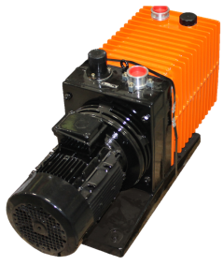 The Alcatel Pascal 2063 series rotary vane pumps have replaceable bushings in the plates, keeping the cost of remanufacturing low. All pumps contain a forced lubrication system, which ensures highest reliability in processes with high gas throughput. The Alcatel Pascal 2063 Series has the following specifications. Download the full manual below.